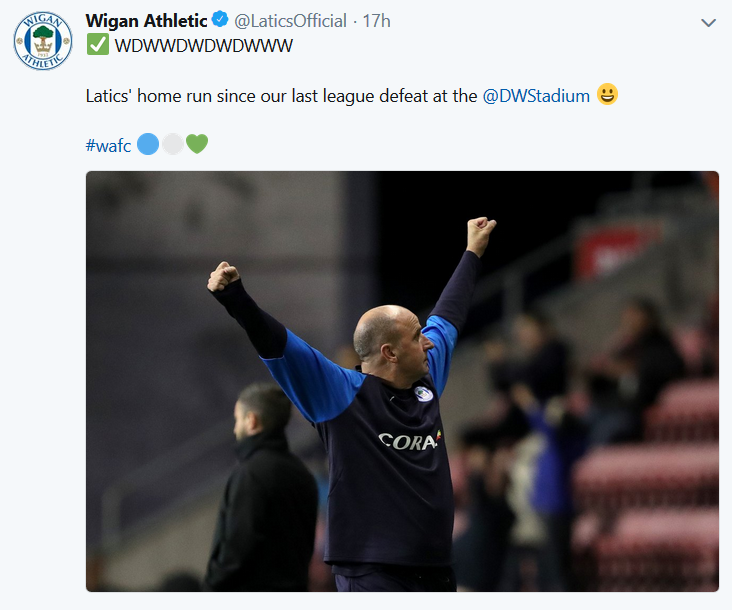 It was throwback to the Wigan Athletic we had seen at the start of the season. Latics were full of energy and invention and their attacking approach simply blew away their near neighbours. This emphatic win puts them 10 points ahead of a Bolton side seemingly doomed for relegation. Joe Garner’s header in the fourth minute gave Latics a big psychological boost. They had started with attacking intent, Michael Jacobs causing problems for Jason Lowe, the Bolton right back being given a yellow card after just three minutes. The early intervention by the referee helped set the tone in a game that could boil over at any time. In the event it was certainly a physical encounter, but Lowe’s card was the only one the referee deemed worthy to give in the remaining 92 minutes. Garner’s header had come from Reece James’ free kick following Lowe’s booking. Garner once again showed that he is worthy of his starting place at centre forward. Yesterday he linked up intelligently with the creative trio of Jacobs, Massey and Powell and gave the corpulent Bolton defenders a hard time. His goal came at a crucial time for a Latics side who desperately needed a boost after an awful display at Blackburn. Cook took Gavin Massey off after 45 minutes in the previous game at Blackburn; Michael Jacobs went off after 61 minutes, with Rovers already two goals up. Was Cook saving them for the Bolton game? Both Jacobs and Massey have had long spells out through injury this season and the cutting edge they provide was badly missed when they were absent. 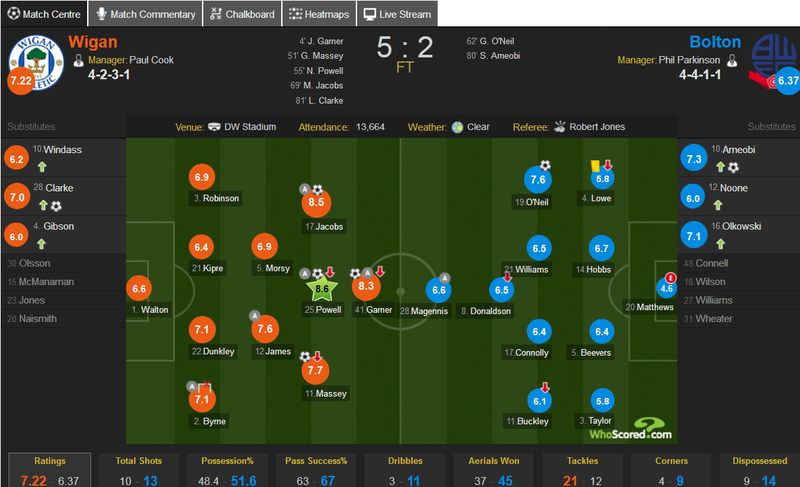 They both had excellent games, each scoring a well-taken goal, Jacobs also getting the assist for Nick Powell’s goal. 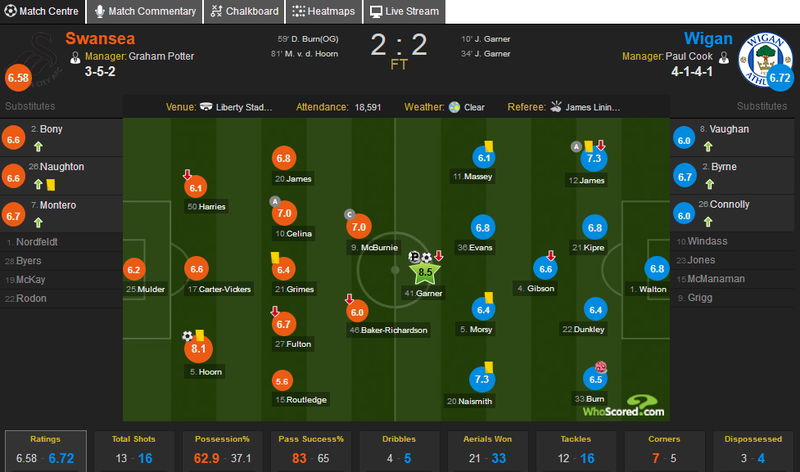 Massey was substituted after 82 minutes but Jacobs completed the whole 90 plus. Their interplay with Powell has always been a joy to watch, as it was once more yesterday. Last season both Jacobs and Massey made 50 appearances. They were key players in the League 1 title winning team. When Latics were last in the Championship in 2016-17 Jacobs was a regular starter and made 46 appearances, scoring 3 goals. However, he did not totally convince that he was a Championship-level player. This season he has made 21 appearances, scoring 4 goals. Yesterday he certainly looked up to the task and showed the kind of energy and creativity that Latics had been lacking when he was put injured. At 27 he is at his peak. Massey scored 6 goals last season, but only one of those was bagged at the DW. Massey is now 26 years old and nearing his peak. After a career in the lower divisions he looks very much at home in the Championship. Late in the proceedings Nathan Byrne hit the post with a rocket shot from 25 yards. If it had gone in it would have been only the second goal scored by a defender for Latics this season and Byrne’s first in 89 appearances. A few minutes earlier Byrne had put in a beautiful long cross for Leon Clarke to head home Wigan’s fifth. Jamie Jones took over the starting goalkeeping position from Christian Walton in early January. It had been a long wait for the Brighton loan player to get his place back. Walton looked more assertive than he had looked in December and could not be faulted for either of the Bolton goals. Both goalkeepers have their strengths and will continue to compete for a place in the starting lineup. One of Jones’ real strengths is his distribution, and this is something Walton needs to continue to work on. With an international break coming up there is time for Danny Fox to recover from his knee injury. Fox’s experience and organisational skills would have been helpful yesterday when Latics defence let in two soft goals that could have allowed Bolton back into the game if it had not been for Wigan’s ability to strike back in attack. We might have expected Wigan Athletic to come racing out of the blocks following their warm weather trip to Dubai. But it was not to be. A pedestrian Latics side failed to capitalise on Jonas Knudsen’s red card after 25 minutes, going behind five minutes later after a soft penalty was conceded by Chey Dunkley. It took a 91st equaliser from substitute Joe Garner to level the scores. Paul Cook made two changes from the previous league game with Stoke. Lee Evans returned in central midfield with Reece James being moved to right back in place of Nathan Byrne. Danny Fox came back from injury to replace Cedric Kipre in the centre of defence. Latics have won only 1 game out of 7 against the five teams below them in the Championship table, that being a 1-0 win over Rotherham at the DW Stadium at the beginning of September. They lost at Ipswich and Millwall. The displays against those teams in danger of relegation have been largely characterised by lethargic build-up play and ineffective finishing. Yesterday’s game simply fitted into a pattern we had seen before. The remaining “6 pointers” are Reading (A) on March 9, Bolton (H) on March 16 and Millwall (H) on May 5, the last day of the season. Why it is that Wigan have seemingly played without much ambition in those games is hard to fathom, although last season their results against the top teams in League 1 were not impressive. They won only 1 out of 6 against the 2nd, 3rd and 4th placed teams. Is there something in the planning for these encounters that emphasises caution? Or is it a mere coincidence that the players have not been at their best in those games? What has happened to Leon Clarke? His return to Wigan was never going to be easy for Leon Clarke. In his previous spell in the second half of the 2014-15 season he had failed to impress, scoring one goal in ten games. Fans queried his appetite for playing the role of the lone centre forward. Clarke impressed in his first game back, scoring a goal and making an assist against QPR. But in the following three games he has been less effective, looking more like the player of the unfortunate era of Malky Mackay. Clarke is at Wigan on loan from Sheffield United until the end of the season. Last season he scored 19 goals in 39 appearances in the Championship. However, with the loan signing of Gary Madine and at 34 years of age, Clarke was allowed to leave the Blades in January. With Sheffield United favouring twin strikers Clarke played well last season, his partnership with Billy Sharp being fruitful. At Wigan he has played as the main central striker with Josh Windass behind him. Is Clarke better in a twin striker role or is it that he is now playing in a struggling team, not getting the kind of service he did at Bramall Lane? Only time will tell if Clarke’s return to the DW is successful. Robinson’s last league appearance was on November 10th at Middlesbrough. In Robinson’s absence through injury Kal Naismith has established himself as the regular starter at left back, despite his previous lack of experience in that position. Most of us expected Cook to sign a new left back over the January window but nothing materialised. Naismith has not had an easy time in that position but has improved as time has passed. At times he has looked all at sea and vulnerable to runs from speedy wingers. But he has also made some outstanding blocks and tackles in and around the penalty box. Cook expects his full backs to push far forward and the Scot has shown skill and determination down the flanks, with an ability to launch pinpoint crosses into the box. Although often under pressure from elements in the crowd Naismith has often shown initiative in a side that has been short on such qualities during a dismal run of results in recent months. Robinson played the first 62 minutes against Shanghai SIPC in Dubai, being replaced by Naismith. Robinson too has faced criticism from fans on the defensive part of his game, although he can excel when going forward, possessing real pace. It was a surprise that Robinson did not appear on the team sheet yesterday. Was he suffering a reaction from the game in Dubai? After a frustrating first half with Latics woefully short of creativity one hoped, in vain, that Cook would make an immediate substitution in the second half to freshen things up. He had been employing two holding midfielders in Evans and Morsy, both sitting deep against a side with ten men. But we had to wait until after the hour mark for Callum McManaman and Nick Powell to come on for Chey Dunkley and Anthony Pilkington. Although Dunkley’s departure was a shock, Morsy being pushed back into the back four, the arrival of McManaman that was a surprise with Gavin Massey staying on the bench. Powell looked decidedly rusty after such little football over these months but will clearly be a key player in Cook’s plans when fully fit. McManaman looked lively, if well policed by the Ipswich defence. The manager’s treatment of McManaman has been unpopular with a lot of the fans. Is this an indication that the player will at last be given a genuine opportunity to prove himself over the games that remain? Again, the results for the other teams in the relegation went largely in Wigan’s favour. Bolton lost at Leeds, Millwall were defeated at home by Preston, Reading and Rotherham shared the points. But Latics have been living precariously for weeks. The optimists will say that they are undefeated in their last four matches, but critics will say that three of those were draws when Wigan were happy to stick with a point. Should just two of those teams have a run of form over the upcoming games then Latics could be in real trouble unless they too start winning matches. Being satisfied with a point rather than seriously trying for the three points might not be enough. To coin a much-used cliché: it was a game of two halves. Latics totally dominated the first half, going into the interval with a two-goal lead that could have easily been more. Their play was a revelation compared with what we have seen over recent months. High tempo attacking football was the order of the day. But the second half was awful, sadly reminiscent of what we have been seeing far to often. The defensive hoof ball approach once again reared its ugly head, the Swans getting back in the game with soft goals from set pieces. When the team sheet became available prior to the match there were groans from Latics fans on the social media. How could Callum McManaman not be included following his excellent performance at West Bromwich? Why was Will Grigg not starting? But Paul Cook’s lineup and tactics worked extremely well in that first half. He had brought Darron Gibson in to sit in front of the back four, with Lee Evans and Sam Morsy pushed further forward. But Latics looked sadly short of any constructive kind of tactical approach in the second half as the home team dominated proceedings. Swansea manager, Darren Potter, had brought on Kyle Naughton and Jefferson Montero at half time, changing his team’s formation. Latics just could not seem to master the new Swansea approach. Why were Latics so Jekyll and Hyde? Cook deserves praise for his brave approach at the start of the game. Evans and Morsy were pushed well forward, as were wingers Gavin Massey and Kal Naismith. Swansea are a side who like to play the ball out from the back, not keen on going long. With the four midfielders and Joe Garner putting constant pressure on defenders who had the ball in their own half the home team’s game fell apart. For once Latics had a piece of fortune after just 10 minutes when Wayne Routledge, a winger playing as a wing back, made a clumsy challenge on Naismith with Garner sending Mulder the wrong way from the penalty. Garner’s second goal from a corner after 33 minutes was well deserved and no surprise given Wigan’s dominance. But that successful approach disappeared when the second half began. Latics fell back on dire defence and could not keep hold of the ball. Cook’s decision to move Dan Burn into a back line of three central defenders was perhaps not a bad idea in theory, but in practice it resulted in a back five. With three holding midfielders in front of them there was little attacking threat. As always, the manager carries the can when things do not turn out as hoped. But Cook’s supporters will say that he was urging his players to move forward in the second half, but to no avail. Playing a high pressing game can be tiring. Was tiredness a factor? Or was it due to the brittle confidence of players reluctant to push forward or to make short passes that might result in losing possession? The high pressing tactics certainly suited Garner. In the first half he had support and service, rather than being left alone to fight giant central defenders for long balls launched from defence. As a result, Garner looked a much better player and his two goals were both well deserved and well taken. Garner is by no means an elegant centre forward: he is not the most skilful, but he is an experienced player with a proven goal scoring record. Although not particularly tall, at 5 ft 10 in, he can leap high and challenge much taller players. He scored 10 goals in 29 starts and 3 substitute appearances for Ipswich last season. With Will Grigg, James Vaughan and Josh Windass challenging him for a place he has had to be satisfied with just 6 starts at Wigan to date. There are fans who continue to question the signing of Garner, for a fee reported to be around £1.2 m. But he is a combative type of centre forward who can unsettle opposition defences, given decent service. It is the 26-year-old Naismith’s first season in the Championship, having spent most of his career in League 2, although he made 20 appearances for Portsmouth last season in League 1. The player had a difficult pre-season with Latics, struggling after being played out of position at left back. But like other players who have played under the manager at previous clubs, Cook clearly believes Naismith can make it in the second tier of English football. Naismith is not the kind of winger who uses pace to get past his full back. But he is industrious, has a good left foot and has a good strike record for a wide player. At the Liberty Stadium, with Latics 2-0 up he had the chance to virtually seal the game for his side, but his shot went narrowly wide. But despite the missed chance he was once again one of the consistent performers on the day, playing in his more natural position in left midfield. After a difficult start to his career at Wigan, playing at a level above he has played before, Naismith continues to develop. Christian Walton, like so many of his teammates, has struggled to maintain the form he showed earlier in the season. But at Swansea he was more dominant in his box and got well behind low shots coming in. Although he has 100 appearances in league football it is Walton’s first season in the Championship. At 23 he can still develop into a top-class goalkeeper. The news of Sam Morsy’s new contract came through on Christmas Day: odd timing. But it was good news, if rather belated. Morsy is not the most technically gifted player, but his selfless approach and sheer industry, make him a key player in Cook’s team. But what is of concern is that there have been no announcements of other contract extensions. It was another learning experience for Wigan Athletic’s young team. After being starved of the ball in the first half, and perhaps fortunate to be on level terms, they improved in the second. As the game progressed the Swans started to tire and Latics started to get a foothold. Despite Swansea’s superiority in possession and shots on goal Will Grigg could have won it for Wigan, but he failed to convert two gilt-edged chances. Did Richardson’s comment reflect upon Wigan’s approach to the game? Let’s take a look at some key points. Richardson was right. Goalless draws are hardly conducive to drawing people to watch football matches, but this one was better than most. Swansea’s football was akin to that of Roberto Martinez’ best at Wigan. Based on possession with intelligent movement. But that is no surprise since the Swans have been playing in that way since Martinez instilled it in them between 2007 and 2009. Since then many managers have come and gone, but the style of football has remained possession-based. It was a pleasure to watch last night. Unlike Swansea Wigan’s style has fluctuated wildly over those years, from the approach of Martinez to the dire long ball stuff we saw in the eras of Owen Coyle and Malky Mackay, to the sterile defensive approach from Warren Joyce. Swansea’s approach work and skill in passing the ball out from the back, despite Wigan’s pressing, was admirable. Their problem is that they don’t possess the quality strikers to put the ball into the back of the net. Cook wisely rested Sam Morsy, who will benefit from the break after being with Egypt in the summer when his teammates were resting. Darren Gibson did a reasonable job of replacing him, not afraid to get stuck into the tackle and putting in lots of effort. But Latics need to get Morsy refreshed and back to his best. 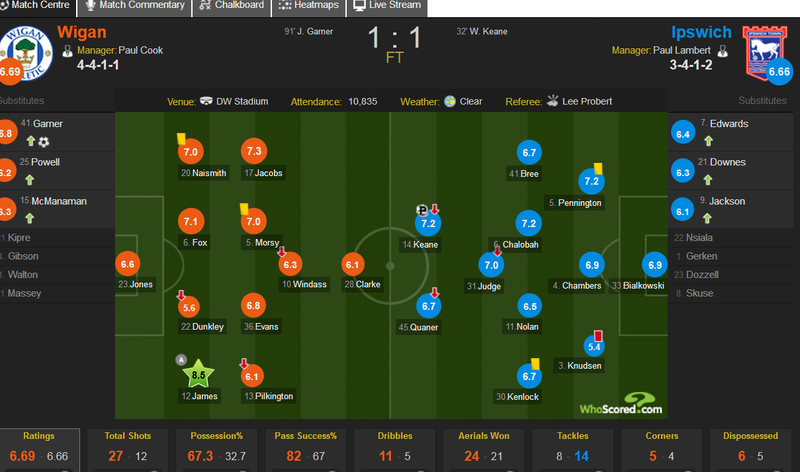 Swansea had too much time and space last night and it is players of the physicality of Morsy who can combat that. Apart from left full back Cook has multiple players competing for places in the other positions. None more so than at centre forward. Will Grigg is Cook’s main choice, but he has to provide Joe Garner and James Vaughan with game time if they are to play a part. Grigg maybe could have done better with the two chances he had, but he was in the right place at the right time to get the opportunities. Cook has also used Nick Powell at centre forward later in games. Were he to concentrate on being a number 9 Powell would certainly give Grigg, Garner and Vaughan a run for their money. When Latics got relegated in 2013 they sold and released lots of players to cut costs. They would have been faced with too many players on Premier League wages with much decreased revenue in the second tier. Even allowing for parachute payments they would have faced financial problems. But Premier League regulars such as Ali Al-Habsi, Emmerson Boyce, James McArthur, Shaun Maloney and Ivan Ramis stayed, along with the likes of Jordi Gomez and Ben Watson. After the dire time under Owen Coyle, Uwe Rosler did a great job in turning the team round and getting them into not only the FA Cup semi-final, but the Championship playoffs. He used a spine of experienced top-flight players together with others brought in during the transfer windows. Swansea have not done that. Only Kyle Naughton in last night’s side was a regular last season. Over the summer they raked in some £45 m in a fire sale of players, together with sending other big earners off on loan. New manager Graham Potter has done well up to this point, putting a hotchpotch group of players together to play skilful possession football. But despite what some confused pundits in the broadcasting and social media might have suggested, this was not a Swansea team laden with ex-Premier League players. Given the circumstances did Cook and his staff pay the Swans too much respect? The early games in the season were exhilarating as Latics attacked and defended as a unit. Since then it has gradually become more fragmented. That lack of cohesion allowed Swansea the time and space to look the better side. Much of this may be down to the physical demands of the Championship with so many games being played in a condensed period. The players were fresh earlier in the season, but that verve has now dissipated as the reality of the fixture congestion has kicked in. On the bright side it was another clean sheet for Latics and Christian Walton, who was once again excellent between the sticks. The prime goal for Latics this season is consolidation. A tight defence would go a long way towards achieving that. Latics have conceded just two goals in the last four matches. Will defensive consolidation be the order of the day to consolidate? Or will we again see that high energy, refreshingly naive, attacking approach that we saw in August? Another valuable three points for Latics over a team in the promotion zone. It was by no means a classic but Latics showed the kind of resolve that will serve them well as the season progresses. Paul Cook once more gave his honest appraisal of how a game went. A draw had appeared the most likely result, but a pinpoint cross from Josh Windass was met in style by Nick Powell to get the deciding goal. It was the highlight of a drab game, where the two teams between them mustered only four shots of target. The last time Latics were in the Championship they won only five games at home in the whole season. They have already won four out of the five played this season. Last season saw Wigan amass more points away from home (51) than at the DW Stadium (47). But they lost just two at home to Bradford City in November and Blackpool in February. Latics were a club to be feared in League 1 and visiting teams would so often come to the DW to frustrate rather than try to win the game. Latics had more space away from home and their football was often more entertaining. Last night we saw a Bristol City attack Latics from the start. City were looking confident in the first half and Wigan had to work hard to keep them from scoring. But a goal can change the psychology of a game and City did not pose the same threat after Nick Powell’s excellent goal after 51 minutes. Nevertheless, Latics still had to work hard to hang on to their lead, not least in the 94th minute when Diedhiou went to close to equalising with a reaction header. The next home game is on October 2nd when Latics entertain Swansea City. It was unfortunate for both teams that this match had been chosen by Sky for Friday night viewing. Having played three games in six days neither team was at its best. The outcome was a game low on entertainment. Sam Morsy was named Man of the Match by Sky following a typical all-action display. The Latics captain is a midfield player who leads by example. But Chey Dunkley was surely also a candidate for MoM, with the kind of solid and determined performance that we have come to expect from him. It has not been an easy season for Dunkley. Not only was he embarking on just his third season in EFL football, but he was to be surrounded by the youngest defence Latics have had in years, with the combined age of his three teammates in the regular back totalling just 59 years. Dunkley himself is only 26, but like Morsy he has led by example in his leadership of that young back line. Dunkley is not the most elegant of central defenders, but his no-nonsense approach makes him a force to be reckoned with by opposition forwards. Cook expects his full backs to move forward with freedom, with the holding midfield players providing defensive cover. But sometimes they too are caught forward and the central defenders can be left exposed. Cedric Kipre has made a fine start to his Latics career, making the transition from just one full season of first team football, that being in the SPL. 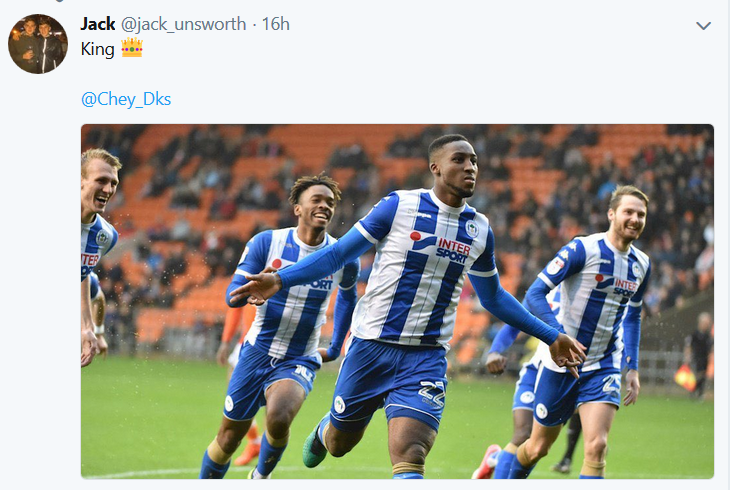 His partnership with Dunkley will be key to Latics’ success this season. Joe Garner is nothing if not a competitor. Brought into the line-up due to the injuries to Will Grigg and James Vaughan, it was his first start of the season. The 30-year-old is 5 ft 10 in tall but is not averse to physical challenges on central defenders who are much bigger. Moreover, he has a good leap and can challenge them in the air. He is strong in holding up the ball. Garner is a different type of player to Grigg and Vaughan. He is certainly combative and last night was perhaps fortunate not to have been given a red card for a crude challenge just before half time. Garner’s strike record is 0.30 goals per league game (108 goals in 363 appearances), compared with Grigg’s at 0.33 (99 goals in 293 appearances) and Vaughan’s at 0.29 (77 goals in 270 appearances). The strike rate for Josh Windass is not so far off, at 0.26 (36 goals in 139 appearances), despite often being played out wide despite his preference for a central striking position. All four strikers have something different to offer, giving Cook lots of options. Why does Michael Jacobs rarely get penalties? In the 22nd minute Michael Jacobs was clearly pushed from behind as he was running inside the penalty box. Jacobs fell in theatrical style but did not impress the referee enough to be awarded a penalty. It has happened so often for the player over the past three seasons. Jacobs’ pace and directness frequently troubles opposition defences who sometimes resort to negative tactics to stop him. But despite going down so many times following dubious challenges in the box, Jacobs rarely wins the penalty. Some players are experts at fooling referees in giving penalties. Jacobs is the opposite, much to his team’s disadvantage. Like so many of the best wingers in the modern game, Jacobs has the ability to cut in from the flanks at full throttle. Running at pace it does not take a lot of contact for the winger to be unbalanced and fall to the ground. That is what has so often happened to Jacobs, but whereas other wingers in similar situations often win penalties, Jacobs rarely does. Would Jacobs have won the penalty last night if he had not fallen so theatrically? It is a hypothetical question but Cook and his staff might want to look at video replays of previous incidents involving Jacobs running into the box. Whether the player is over-reacting or whether it is his natural fall in such circumstances is hard to say, but last night he was denied a penalty that was merited. It seems to be an endless saga. Will the takeover actually happen? The Sky commentary team told us last night that it will be concluded in the next three months. Why the deal is taking so long is puzzling to so many of us as fans. Will all be revealed in the end, when and if, the takeover happens?